James Neiss/staff photographerLewiston, NY - Our Lady of Angels Association Vincentian Charities honoring those keeping the spirit of St. Vincent de Paul alive during a luncheon at the Niagara Falls Country Club. 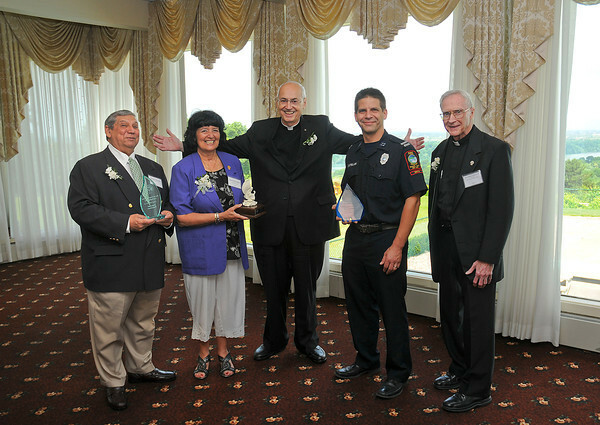 Honored for their charitable works were, from left, James Cancemi, of Cancemi Furniture received the Good Neighbor Award, Maria Stevenson received the Special Angels Award, plus Niagara Falls Fire Department Capt. John Castellani and Chief Thomas Colangelo, not in photo, who received the Martin Blake Award. Hosting the luncheon is Rev. Joseph Levesque, C.M. President of Niagara University, center, and Rev. William J. O'Brien, C.M., executive director of the Our Lady of Angels Association, right.